It’s been a long time since 0.0.13 but it’s been very busy with conferences, vacations, … . Anyways I’m happy to announce a new release 0.0.14 of e(fx)clipse. Let’s go straight into the changes and new features. 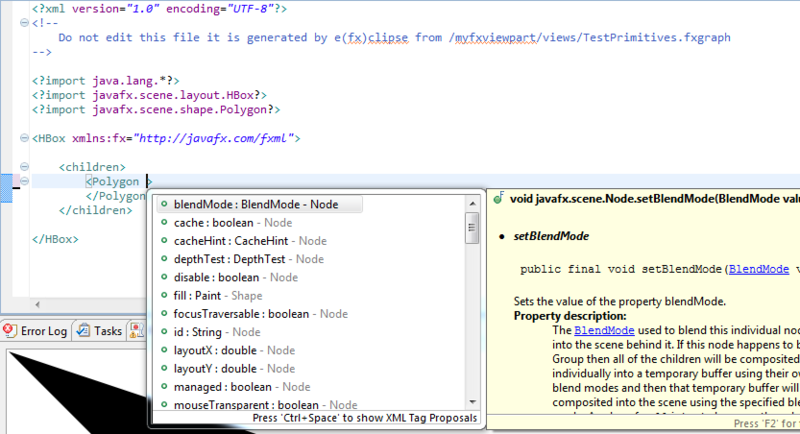 It looks more and more people use e(fx)clipse for their JavaFX development. Our google group has now 31 members. The all-in-one package of 0.0.13 has been downloaded 2400 times! The prepackaged distributions got an update. They are now shipped with Subclipse 1.8.9, Xtext 2.3.0-RC1 and now include WST-XML-Tools (see below on the reason for it). Oracle now also started to release Linux-64bit 2.2 builds and so Linux-Gtk-64 joined all-in-one download and because we are approach the final Juno release I’ve the first time also packaged 3.8 downloads for you. The OSGi-Classloading is now able to detect the javafxrt.jar on OS-X when running with JDK-7u4 so OS-X developers and users get a seemless experience like Windows user did since the beginning. 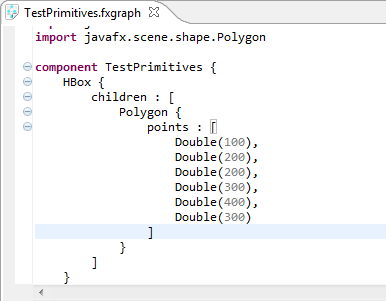 I’ve also managed to work around a crash in conjunction with the JavaFX/SWT-embeding where Java crashed because native code tried to load classes through reflection. 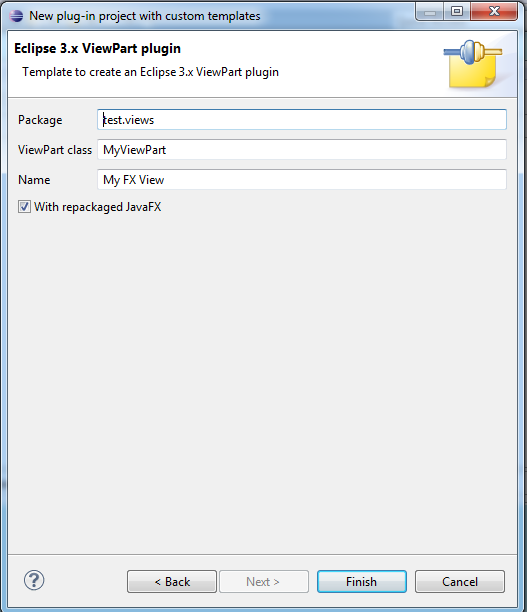 This is an important fix for everyone who’d like to use JavaFX for Eclipse Plugin development. Most of time I spend rewritting the internals of the tooling code to be enterprise ready – for those of you who looked at 0.0.13 resources will agree with me that this not how reliable and maintainable code should look like. Still there is new cool stuff available. The syntax for numbers, … has been improved tremendously compared 0.0.13. 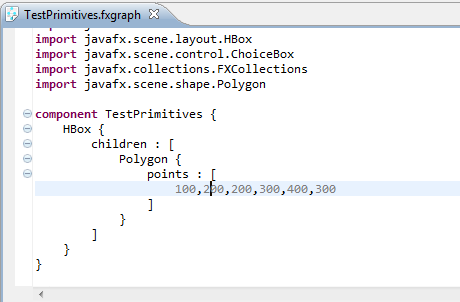 You can now reference another fxgraph component which defines the scene your current fxgraph file should get embedded when shown in the preview. 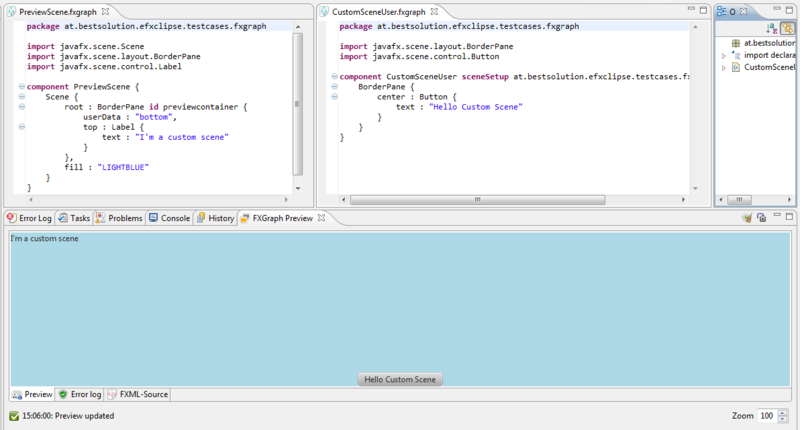 This allows you to mimic better the final UI your control is getting embedded into. The completion engine now also consults the builder associated with a class and so it shows proposals for properties who have to be defined at construction time. A good example of a class that has readonly properties is the Color-Class. This is where most of my energy went to in this release. I’ve switched the FXML-Editor from Xtext to a customized WST-XML one. 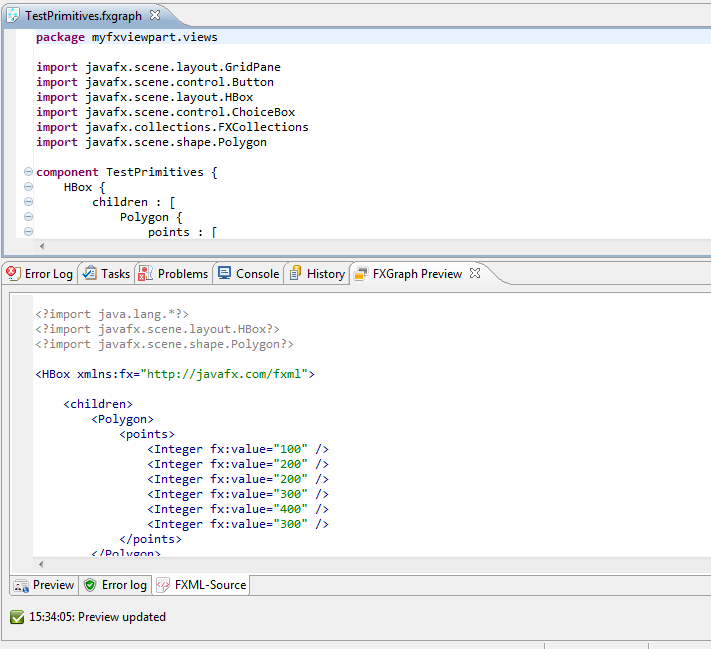 Those of you who love FXML have now 99% the same development experience than those using fxgraph! 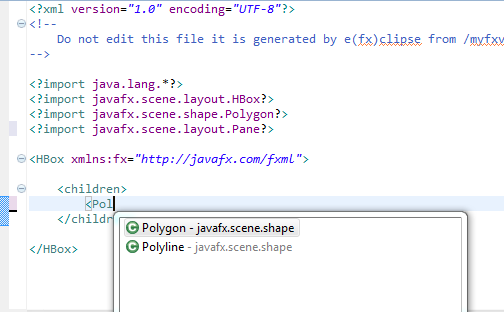 One of the main reason you might use FXML is that Oracles WYSIWYG-FXML-Editor SceneBuilder uses it as the storage format. The change to WST-XML is the reason why it is now packaged with the all-in-one downloads. 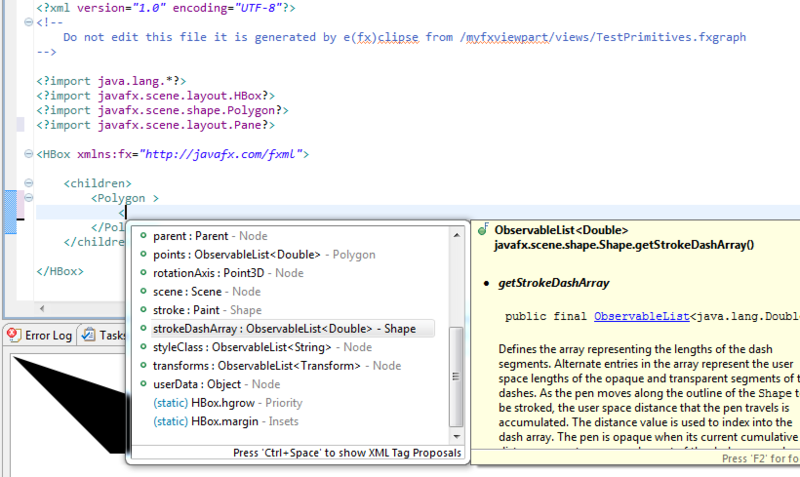 The preview now has an extra tab showing the FXML-Document renderered which helps sometimes to identify a problem. 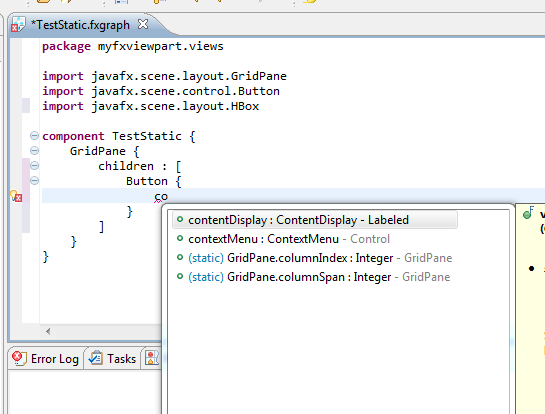 A new wizard supporting developers to create a JavaFX enabled ViewPart has been added. 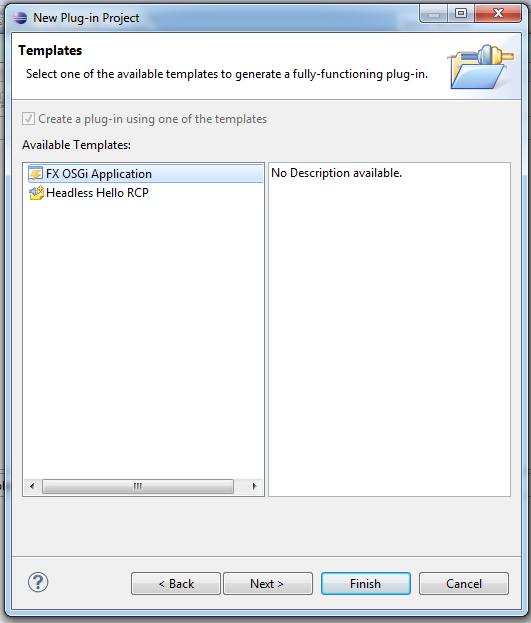 A wizard which creates a complete runnable JavaFX (Equinox) OSGi application has been added. That’s it for 0.0.14! I hope you find those new features useful! If you happen to have problems, questions, … join our google group. Your release rate is really impressive. Have you some plans for other JVM languages integration (Scala, Groovy ?) into efxclipse ? With other languages you mean GroovyFX and ScalaFX? Then yes – I’m just experimenting with Groovy and have scheduled integration for it to 0.1.0 (http://efxclipse.org/trac/ticket/170) which is to be released in the next few days. Problem with ScalaFX is that the Scala-Tooling only supports Eclipse 3.6 and 3.7 but the reference platform is going to be 3.8/4.2 in the future. It’s been a long time since the last update. Is the plugin dropped? Or?